Anantha Padmanabha Vrata is observed on the 14th day of the Shukla Paksha (waxing phase of moon) in Bhadrapad month. Anantha Padmanabha Vrata 2019 date is September 12. 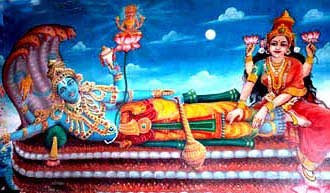 It is widely believed that Lord Vishnu appeared in the form of Anantha Padmanabha (the Ananta Sayana form of Lord Vishnu or reclining on Ananta) on this day. A fast from sunrise to sunset is observed on the day by Vishnu devotees and it is known as Anantha Padmanabha Vrata. The importance of the Vratam was narrated by Lord Krishna to Yudhishtira. Lord Krishna advised the eldest of the Pandavas to observe Anantha Padmanabha Vrata for 14 years to get back his lost kingdom. A unique ritual on the day is the tying of Ananta Dhara, a sacred thread of 14 knots, on the hands by devotees after special pujas and rituals. In Maharashtra and in parts of Andhra Pradesh, Anant Chaturdashi is popular as the last day of Vinayaka Chaturthi festival – Ganesh Visarjan.